A new thread for a new year! Found a hot deal? Tried a new product? What will you buy again? What didn’t wow you? The HO hive mind wants to know! Please mention your area - some products may be regional. There are still some good closeouts on seasonal items from the holiday season. I snagged the last Maple View Roast duck half which was marked down to $6.29. They have had a frozen seared tuna which a fellow shopper was raving about. The tuna has been discounted from $8 to $5.24 so I purchased one to try tomorrow. Speculoos cookies were marked down low but were gone when I went back for more. Halo’s have been delicious and are $2.69 this week. Edit: Duh…can’t even follow my own request! I shop in Raleigh, NC! I have to try the duck now that I’m back… saw it when I did a pre-travel shop in Dec but didn’t want to stockpile. Though I did get a bunch of interesting wax-covered cheeses and truffle and champagne cheddars that I have yet to break into. Borgonzola - $3.49 - (nay, kind of a cross between Brie and blue cheese with very little BC flavor). Potatoes with Green Beans, only to have them vanish, presumably never to be seen again. My location has two areas with frozen foods. The larger area along the wall has the most and these selections stay pretty consistent. The smaller freestanding freezer has “specials”. I have found that many of these reappear on a yearly basis. Now I purchase a new-to-me item from the small bin and try it that day. Then I can return and get more before they run out. You did good! I checked in Raleigh, NC today but they were priced $3.99/lb. Now I purchase a new-to-me item from the small bin and try it that day. Then I can return and get more before they run out. I will keep looking for the stuff I like to return next year, though. There was a meusli last year I liked that didn’t come back this year. I found an unopened box left in my cupboard (never happens, I was surprised). I am picking through it, about 10 minutes every day, separating and weighing all the ingredients so I can recreate it myself. So unless you are crazy, yes, it is very annoying that so many items are never brought back. They are worse than trader joe’s in this regard. That was very good! I’ve been watching for it too. A can of Brookfield Corned Beef Hash - $1.69 (no processing location stated). Enough savings here to convince me to put the store in our grocery shopping rotation. (Raleigh, NC) I saw 3 different packets of assorted grains in the “special purchase” area. They are rather small, about 6" high x 3" wide. The brand is Earthly Grains. There was a 5 grain, a grain (barley?) with peas and green lentils, and a quinoa + something blend. They are priced around 1.89. I tried the 5 grain the other night. It’s a mix of spelt, barley, wheat, riice & oats. Nothing else! Product of Italy. 1/4 c. dry was a perfect serving for one. I cooked on the stove and found it did need a little more time than directed (10 minuties). Microwave instructions are on package too. I was pleased and will stop by to purchase more. Nice flavor and texture made for a pleasant side dish. I like that it is just grains, no seasoning added. I’m a light eater so something like this is an easy way to increase the variety of grains for the week. Just a heads up. 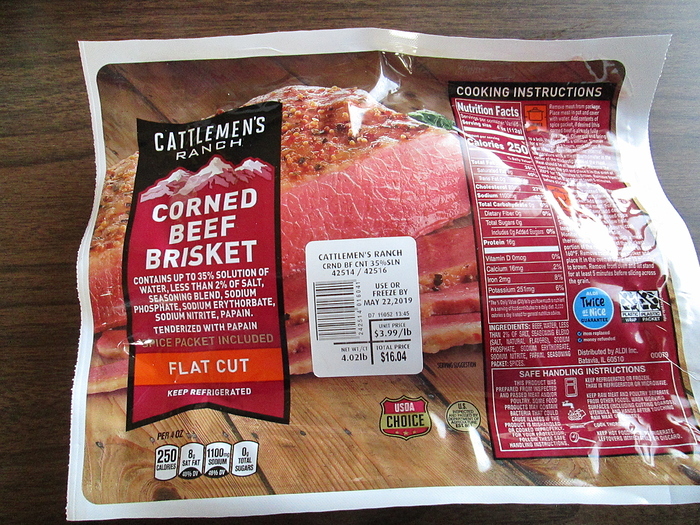 Don’t make a special trip to Aldi for the advertised $2.99 corned beef (like I did😊) without calling first…All the stores in this area are out as is the warehouse. Not sure about the rest of the country. I’ve been staring at the one we bought for three days now. St Patrick’s Day can’t come soon enough in this house. I think it is back! There were 3 varieties of meusli in the “special purchase aisle” today in NC. The ingredients and packaging seem to mesh with my memory of last years offering. Nay on the frozen Season’s Choice Spring Blend (with sugar snap peas). The sugar snap peas are very fibrous and parts of them have the consistency of plastic. Nay to Savoritz wheat thin crackers. They are oddly thick and too sweet. A pale imitation.